Joining the early Danish OVE wind-gatherings from 1975, Erik Grove-Nielsen learned, that self builders always had problems building blades. Pictured, a turbine at Vorbasse, Denmark made by the local blacksmith, from automotive parts, steel tubes and plates. The design was clearly inspired by Johannes Juuls GEDSER turbine, but without air brakes! So why not start a production of "off the shelf" blades? In early summer of 1977 I decided to begin production. I borrowed this blade mould in september 1977, and later bought it. The blades made by TV Glasfiber, running on Leif Nilesens turbine were poorly crafted in the root section, and one blade failed on June 11th. 1978. A group of 3 young wind enthusiasts: Jens Gjerding (now TRIPOD GROUP), Henrik Stiesdal (now CTO of SIEMENS WINDPOWER) and Erik Grove-Nielsen visited the failed turbine on June 12th. 1978. August 8th 1977 - I established Økær Vind Energi, borrowed the PTG mould and later purchased this mould at a price of 2.500 danish kroner. ( US$400). Employee Christian at the first blades produced. November 26th 1977 the first set of blades was delivered to Svend Adolfsen. Svend was an electrician and mechanic, and had a small shop. He was very innovative. 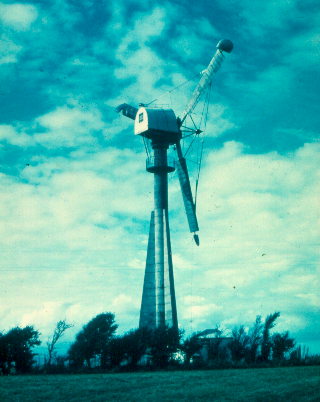 For practical reasons, the height of the prototype turbine tower was only 6 m. As the blades were 4.5 m long, his sheep, grazing under the turbine, could pass safely under the rotating blade tips! When Svend felt more secure, he mounted 1, and later 2 more 6 meter tower sections to a total height of 18 meter. Besides the Stayed-Rotor Riisager turbine, Svend Adolfsen became the first Danish company to manufacture a grid connected wind turbine in serial production, in the new era. 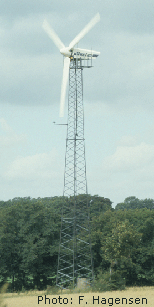 (In world war II the Danish company FL Smith erected several grid connected turbines in Denmark). Adofsen, and later his successor Kuriant, was the main customer for Økær Vind Energi in years 1977- 79. The 4.5 m blades were copies of a Tvind design, and not very effective. We only sold 4 sets of these blades, and had no new orders by january 1978. My one employee, Christian left for Sweden. I had a small advertisement in a major Danish newspaper "Jyllands Posten". I had a few reactions from blacksmiths in western Denmark, and I started a journey in my Volkswagen with a blade pointing out of the rear hatch - to several blacksmiths around the country to persuade them to start up a wind turbine production. No one was ready for that! One month later I was contacted by Preben Maegaard from the small local association called NIVE. (See "grassroots’ pages") He had gathered 4 local people, who wanted to build their own wind turbines. Preben wanted the turbine blades to be 5 meter long, and have a tip speed of around 40 m/s and thus revolutions of 75 rpm. I made a new model (plug) and later a mould. I also made a glass filament wetting machine allowing me to produce one blade per day. The body of the filament winding machine was made of wood. The motor and other electric parts were picked up at the local scrap yard! Before I made the model, I had to make a major decision: should the rotor turn clockwise or counter clockwise? The Old Danish tradition prescribed counter clockwise rotation. This tradition was also adopted by the late wind turbine pioneer, Christian Riisager, and also by the TVIND Community for their initial 11 kW Turbine named PTG. But my wife, Tove, being an individualist, and not at all attracted by the TVIND community, suggested our blade design should turn the opposite direction of the TVIND PTG blades. My younger brother Johannes was part of the Wind Turbine Crew at TVIND...and I often may have tried to compete with their results: At Tvind they worked together as a collective, whereas we were individualists working together with other individualists across the country. This discussion and design solution – taken place around the kitchen table – became trend setting for future Danish and international Wind Turbine design. Our future blade customers: Vestas, Bonus (now Siemens), Nordtank and Enercon years later became technology and market leaders in the international wind power industry. For some years descendants of the Riisager Turbine: Windmatic and Tellus - all turning counter clockwise - were seen in the Danish landscape alongside with turbines from Vestas, Bonus, Nordtank and other turbines all turning clockwise. Eventually the Danish turbine manufactures mentioned above conquered not only the Danish market but the international wind market and the Danish Concept was born with the clockwise turning wind turbine. The Danish clockwise turning concept became the global standard. Why do today’s wind turbines turn clockwise? - Find the answer here. 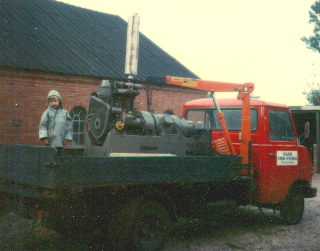 The first set of 5 meter blades was delivered May 26th 1978 to Blacksmith Niels Kristian Krogh of Stoholm, Denmark. Next deliveries were made to 3 members of the NIVE group and to Karl Erik Jørgensen at Herborg. At this early moment, no legislation or security regulations existed. The only demand from the public was a mandatory 10 mm steel wire running through the blade, connecting the three blades in the hub, in case of the blades leaving the hub. Every 5 m blade that I produced in the first year was object to a static load test. Our old Volkswagen Transporter was used for delivering 5 meter blades. All blades were delivered to self builders in Denmark, Sweden, Holland, Belgium and Germany, as no wind turbine manufacturers existed in 1978 in Europe at that time. 2 years later, nearly 20 small Wind Turbine manufacturers popped up like mushrooms in Denmark. 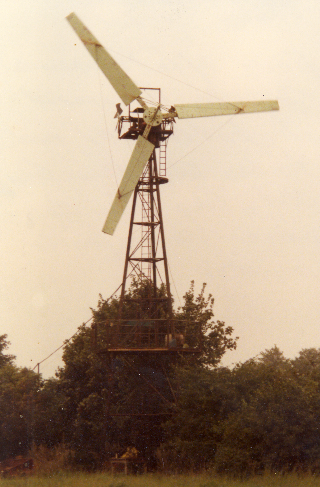 In summer 1978 (whitsuntide) the "sustainable energy people" gathered at a popular meeting place called "Himmelbjerget" to look at displayed wind turbine parts, Bio-gas, solar heat and information on - mostly - the threats of nuclear power. Speeches and folk music was also part of the day. The longhaired man in dirty trousers lifting his "Sail wing"-blade, (influenced by earlier Princeton University design) is Henrik Stiesdal (now Siemens Wind power). Unknown persons standing at our new 5 meter Økær Blade in the background. Bio-gas in the yellow-top gas cylinder. Our first 5 meter blades were not equipped with tip-brakes. On September 2nd 1978, Karl Erik Jørgensens 30 kw turbine at Herborg had a runaway and the 3 blades were centrifugated away from the hub. (The hub disassembled). Less than 14 days later, on September 15th 1978 Kristian Krogh's 22 kW Turbine at Stoholm crashed in a runaway at 25 m/s. Mechanical brakes failed in the storm, the yaw bearing collapsed, and finally the entire nacelle came down. After these two runaways I stopped blade-production. At first I worked on an aerodynamic brake solution including brake parachutes - inspired by the TVIND 1.2 MW turbine. However one of my self builder customers: Henry Jørgensen, advised me, not to do so: "If they are annoyed by the parachutes coming out too often, they will just cut the wires, and then you have no security again - so why don´t you look to the tip brakes of the old GEDSER Turbine ? ". So I listened to his advice and acquired Johannes Juuls old patent drawings from the year of my own birth 1949. His system was based on hydraulics, but I wanted a failsafe system, where the turnable tips were autonomous, and required no control system made by the self builder. So my blades would always be delivered with built in safety against runaway. Therefore I built in a spring loaded system. As my production was halted, the invoices kept coming but no incomes were created. Furthermore the motor of our Volkswagen Transporter broke down. The bank did not want to loan us money for a spare motor - My wife used the VW to drive to her evening shift work, and - living in the countryside, this was a problem. In this despair i contacted Lars Albertsen, one of the main forces of the grassroot-organisation OVE, he then contacted Professor Niels I. Meyer, Copenhagen, who had a seat in the board of a private industrial Innovation Foundation. One week later a check of 50.000 Danish kroner (US$ 8.000) came in our letterbox. These money saved our company from bankruptcy. We did not loose our home, the new safety system could be developed, and we could have our VW running again..
After 2 month of hard work, a tip-brake system was designed, produced and installed in a new set of blades. On November 13th 1978 I delivered the 3 first blades with air brakes to Karl Erik Jørgensen, Herborg Vindkraft (HVK). A few days later he called me to say that the blades were installed, now we should test the new air brakes in a runaway test. The wind speed was around 12 - 15 m/s - and I wanted to wait for lower wind speeds. Karl Erik said : "Then I will do it alone.." - so I had to pick up a rented strip chart recorder and hurry to Herborg together with a witness from the Technological Institute of Århus. When the relay for the generator was removed, the mechanical brake system set out of order, the turbine speeded up very fast. This was an adrenalin kick. Suddenly the noise of the tip-brakes coming out calmed me down, and reduced the speed of the rotor. The mechanical system in this first set of secure blades was produced by Karl Erik Jørgensen. Due to problems with noise we changed the system and put the springs inside the tip for the next sets of blades. The brand new 5 meter ØKÆR blades with aerodynamic tip brakes mounted on the 30 kW HVK turbine. Karl Erik Jørgensen developed the turbine with the help of a a young student with outstanding engineering skills: Henrik Stiesdal of nearby village Vildbjerg. (Helleskov). More text and photos from the Herborg shop in the "Self builders" part of "Grassroots 1975 -79" on this web site. 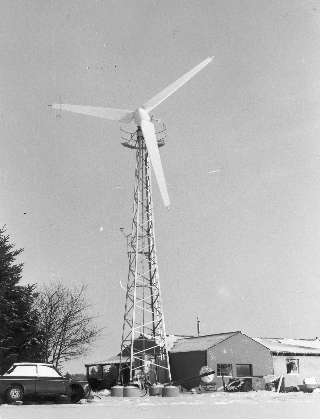 When Karl Erik - after serious illness - could not climb the tower, he invented and mounted an elevator on this 37 kW turbine at the family home and mechanics shop in Herborg. Karl Erik died October 2nd 1982. A new design of the tip brake system with interior springs, was designed with the help of Svend Adolfsen. New developments were often made in the kitchen at Karl Erik Jørgensen or Svend Adolfsens home. A standard ingredient at those design talks was sandwiches with homemade strawberry-jam made by their wives. The 1 MW TVIND turbine began producing electricity in march 1978. The turbine was built by teachers and pupils at the schools, in an incredibly tough and long lasting working period. 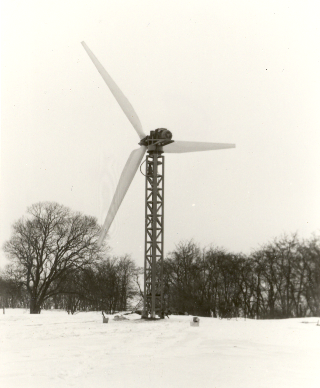 This turbine was a beacon and a great inspiration for the early Danish wind power community. Due to the location of this plant, only 20 km from Danish Capital Copenhagen, a decision was taken in the Swedish government to close down the facility. On May 31st 2005 operation was stopped. Decommissioning of the plant will begin 2020 and is planned to be finished by 2027. (for land based turbines, and probably a few weeks for offshore turbines). Every ton of material can be recycled into new products. No waste is left over as a burden to our children. August 1979 the Danish parliament (Folketing) passed a legislation that secured a state grant of 30 % of the cost of a new Wind Turbine. Gradually this grant was lowered to 20 % and later to 10 %. In 1986 it was finally removed. Økær Vind Energi delivered the first 5 m blades for Kuriant August 29th 1979 - for their prototype. The design was developed by Svend Adolfsen, based on the Adolfsen turbine shown earlier. 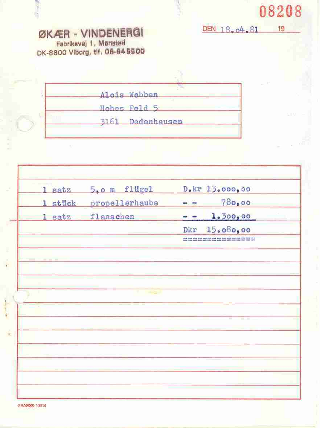 Adolfsen and Kuriant signed an agreement on November 9th 1979. At this time Økær employed 4 people, and had an annual growth in turnover of ca. 400 %. 2 years later we employed 13 people. Økær Vind Energi delivered the first 5 m blades for Nordtank in March 1980 -for their prototype. Økær Vind Energi delivered the first 5 m blades for Bonus in December 1980 - for their prototype. At that time the company name was Danregn Vindkraft A/S. In 2004/2005 Bonus was acquired by SIEMENS. The new name is Siemens Wind Power. Vestas began producing Karl Erik's 30 kW turbines, now called Vestas HVK 10. Shortly hereafter, Karl Erik wanted to develop a bigger turbine - a 55 kW, and therefore urged me to develop a blade for that. This was the 7.5 m blade. The first set was delivered March 13th 1980 - to Vestas - for the Vestas HVK 15 (55kW). A few years later, the 55 kW turbines of Vestas, Nordtank and Bonus (Danregn) became the "working horses" in California, when "the great wind rush" took place in 1982 - 86. Previous to the license agreement with Karl Erik Jørgensen, Herborg - Vestas erected a Darrieus turbine (seen in the background) designed by Leon Bjervig. However the results obtained with the 3-bladed horizontal Herborg design was convincing, so Vestas stopped working with the Darrieus type. 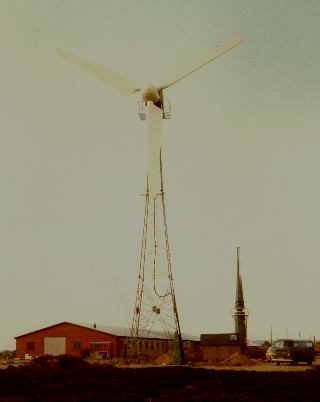 When the first set of 7.5 meter blades was delivered to Vestas in 1980, no test rig existed for that size of blade! For a year I had applied for a cheap state loan for building a new production facility at Sparkær. The authorities did not believe in a future for Wind Power, so I finally got a "no". In summertime we had to place 2 garden irrigation sprinklers on the canvas roof to cool down the tent-like building. Taking blades out of the primitive production hall was tricky - an electro-hydraulic crane mounted on our Hanomag F-45 truck helped do the job. The delivery job - rotated between the employees - as I wanted them to feel the joy of delivering their own work to our customers. A day off from the fibreglass work. Soon Vestas filled our order book, together with Nordtank, Bonus and all the self builders. 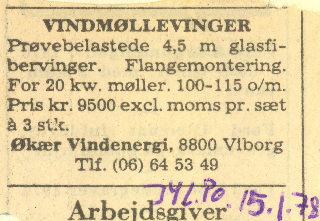 The growth in Økær Vind Energi turnover was around 400 % for the years 1977 to 1981. I applied for low interest loan from the Danish government - for rural areas - but the answer - after 1 year of waiting (producing 7.5 m blades in a canvas tent) was no ! - they did not see any promising future in wind power at all. September 1980 I bought an industrial building in nearby village Mønsted, and equipped it for fibreglass blade production. In Mønsted I employed 13 workers, and there was a continuous development of new molds and new blade sizes. Now the employees were not only grass root people, but many were union members, who required better working conditions. The business was developing, and logistic systems etc. was improved. 9 days before Christmas 1980 the disaster happened: A 7.5 m blade mounted on a Vestas 55 kW turbine in Hinnerup, Denmark failed in a storm. At a distance of 2.5 m from the blade root, one blade failed in buckling. The turbine had a special power-reducing system: When the power exceeded rated power, the turbine would yaw out of the wind to reduce the generator output. Standing in skew airflow the rotor blades will see severe flap wise fatigue loads. As a consequence of the Hinnerup accident, this type of regulation was now banned by The Test Station for Small Wind turbines at RISØ. Another detail of the Hinnerup accident was, that the turbine was placed over the edge of a gorge, also giving very turbulent winds to the turbine. Nevertheless the main reason was a weak blade construction in combination with a production flaw. In less than a weeks time we designed and constructed a static test rig for a blade test. My blacksmith - Børge Mogensen of Sparkær did the job, and we tested a 7.5 m blade in our production hall. The design fault was clear to see. Bad skin stability and a weak spot where two interior foam areas met, created a wedge, leading to local buckling of the blade-skin.We had delivered 20 sets of 7.5 m blades. This was a hard blow to Vestas. And that Christmas was quite special for my own family too. Dust leaves at the second of failure - Buckling kills. The test was performed by 3 individuals : Blacksmith Børge Mogensen, Manager of Vestas Wind Energy Finn M. Hansen (Son of Peter Hansen) and myself. A revised design was made in the next 3 month time in cooperation with Jørn Thirstrup of Vestas and Aage Lystup of RISØ National Laboratory. From january 1981 we produced only 2.5 m , 3.5 m , 5 m, 6 m blades. The production of the revised 7.5 m blade was resumed in month of march 1981. But we lost much money. Gradually the economics of Økær Vind Energi became critical. At the night of the test to failure - Finn M. Hansen of Vestas asked me twice: "What is the price of your company?". I was not willing to sell, as this would pose a threat to all our other customers. (Danregn(Bonus), Nordtank etc.) In reality Økær was a monopoly at that time. I had brought Vestas in a bad situation: They had to shift blades on all 55 kW turbines delivered. Their main competitors: Nordtank and Danregn (Bonus) did not have that problem, as they had not yet built any 55 kW turbines. With Vestas we made an agreement: We should deliver new blades to replace the weak 7.5 m blades. Vestas paid for the materials and some of the wages included in each blade. First and foremost, the blade was redesigned in a joint effort between, Vestas, Økær and RISØ-Materials Research Department. 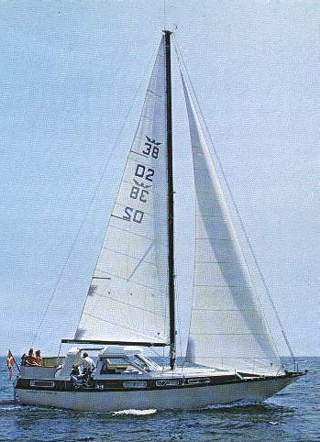 In winter 1980/81 the 7.5 m blade was redesigned. A longitudinal spar, intended to avoid buckling of the blade skin, was introduced, as well as "plates" of longitudinal - glass-rowing. The rowing-plates were made on a new filament-wetting machine, built in autumn 1980. The "rovingplater" is seen in the slide show below. Økær Vind Energi delivered the first 7.5 m blades for Nordtank in February 1981. This blade set was a special model with higher strength, but no static test was performed, as Nordtank was very much in a hurry to build their first 55 kW turbine. Peter Mørup of Nordtank persuaded me to deliver the blades. The first 7.5 m blades were delivered for Bonus (Danregn Vindkraft A/S) later in 1981 - (AeroStar). Alongside with the chaotic economic situation I negotiated a license agreement with owner Preben Nielsen of Coronet Boats near Copenhagen. April 27th I signed the license agreement. The contact to Coronet was obtained through the innovative and charismatic head of the Skive Business School, Niels Aage Bjerre. With two other individuals he founded DIFKO and other companies, that allowed ordinary people to invest together in a new way, and at the same time having tax credits. Niels Aage knew Preben Nielsen from earlier investments in cargo ships built on the Burmeister & Wain Shipyard in Copenhagen, where Preben was a former CEO. For some time I considered a cooperation with LM Glasfiber, but they had an agreement with Windmatic, for whom they produced costum designed blades. At that time LM did not do their own blade design. I judged that I might get a better cooperation with Coronet. The first 5 m blades for Enercon-founder Aloys Wobben were delivered April 18th 1981. Later ENERCON started acquiring 7.5 m blades from Coronet/Aerostar from September 24th 1984. As the substitution blades delivered to Vestas occupied most of our production time, and did not create enough earnings our economy got worse. At Whitsuntide in may, we were not able to pay our electricity bill. The power company therefore cut the supply to our production site at Mønsted, and our private home at Sparkær. After one day I had rented and installed a 27 kW Diesel Standby Power Generator at Mønsted. By the push of a button the production was online again! My employees were astonished, but it worked. At our home the heating and water supply was thus unable to work, so my wife used a bucket on a rope to get water from our well. We had two boys of 2 and 4 years of age at that time. 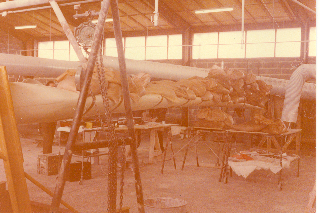 In may 1981 we shipped the first mould and equipment to Coronet in Slagelse, followed by a skilled worker to train the boat builders at Coronet - now to produce wind turbine blades. In June the rest of our molds were shipped to Coronet, and Økær Vind Energy stopped production and went bankrupt shortly thereafter. Despite this chaotic situation, the customers had their blades delivered. And after month of june, there were no delays in production. Continuity was obtained. A few years later, the manufacturing of Boats stopped, as Wind Turbine Blades took over the scene.